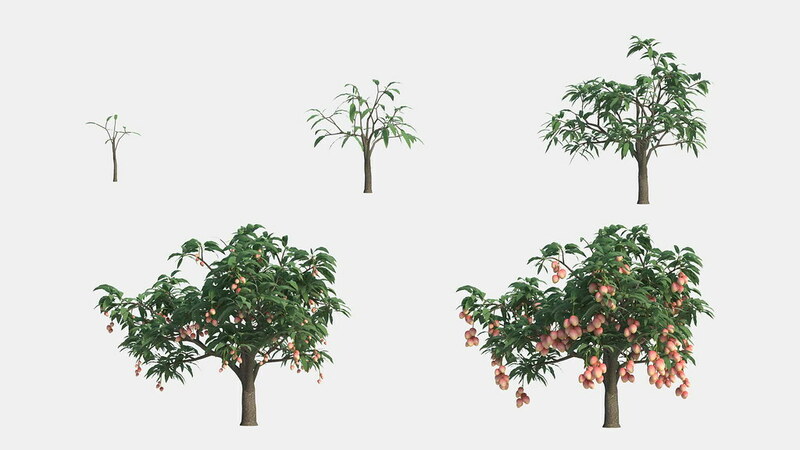 GrowFX provides a powerful growth animation function. People will use several days to created a growth plant model in the past, but a few hours through GrowFX now. 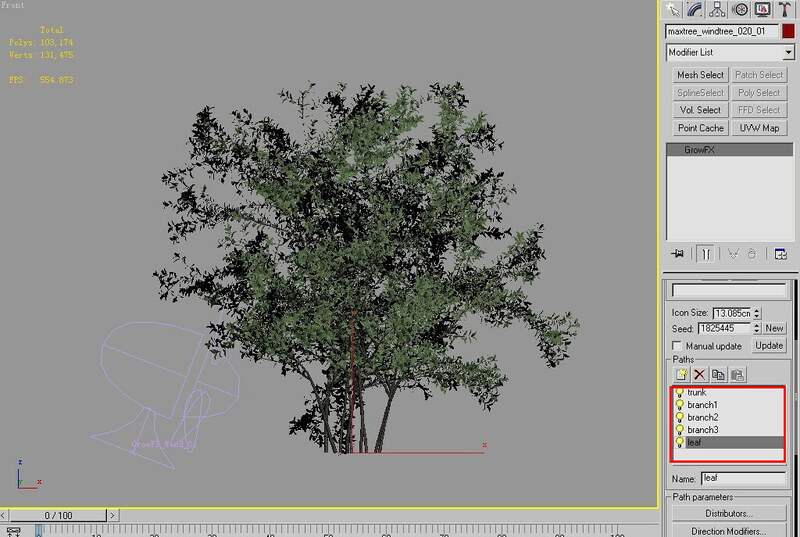 Let’s start this tutorial with a small tree, this is a small Broadleaf tree created in GrowFX with 5 paths. And then select path ”trunk”, open “Direction modifiers”, you will see this trunk have 200cm length, remember this value, it’s very important when we setup grow parameters. Open “affect parameters” of “parameter length”, then create affect “trunk->cylinder_mesh_01->radius” ,this affect means if the length of trunk changed,the radius of cylinder_mesh_01 will follow changed too. 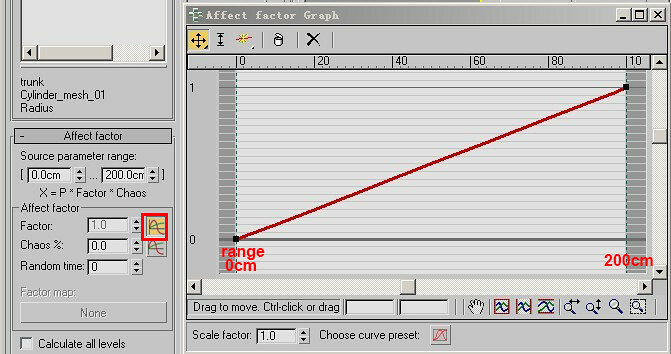 In “Affect factor” rollout you can see “source parameter range”, this range control the range of model’s grow start and end., the default value is 0cm-100cm.,that means the affect that you created will changed when the length of trunk from 0cm to 100cm,but this trunk is 200cm, so we must set this range 0cm-200cm. Try to change the length of trunk, the radius doesn’t have any change. That is because we didn’t set the value of “Factor” in “Affect factor” rollout, Factor will change the value of affect that you created. At this point, we use it control the radius of trunk., the default value is “1”, that means in the affect range the value of radius will change from 1*(radius value of trunk ) to 1*(radius value of trunk ), of course the radius will not change,because the start value of “Factor” as same as the end value of “Factor”,both are “1”,we must control the values of “Factor” at start and end are different values. So. open the “graph” panel of “Factor”.the default setting is good enough for grow. The left side of graph shows the value of trunk 0cm.the right side shows 200cm.as same as the range. So the value of “Factor” will change from 0 to 1. Now you can control the length of trunk between 0cm to 200cm. you will see the radius will changed follow the length. 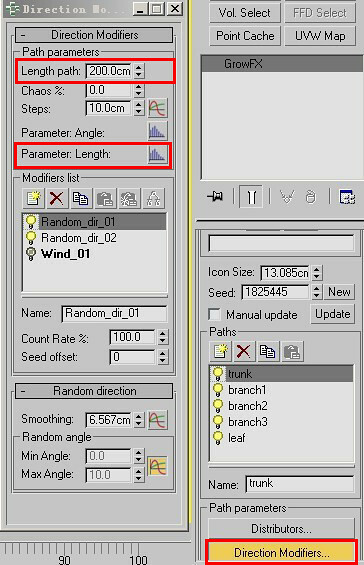 According to the above method, you can create affect of length or radius of branch and leaves. How to setup grow parameters in GrowFX from suitlm on Vimeo. Tutorials about necessity of forest pack and uses of forest pack helping me to know some new process as an artist. But I think product value of this MAXTREE are high. We are Maxtree, We focused on environmental solutions in 3D program, offer the best products for 3D artist and Company to solving create environment element in 3D program.